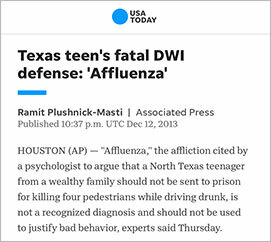 One of the higher profile cases in Texas history involving DWI was the case of Ethan Couch - the 16-year-old DWI offender diagnosed with “Affluenza” or an affliction that affects wealthy people with a lack of motivation, feelings of guilt, and a sense of isolation. A DWI, or a conviction that finds a driver guilty of Driving Under the Influence, is a misdemeanor, and a serious offense in Texas. Court records that result in conviction of a person found to have been operating a vehicle while under the influence of alcohol or another inebriant are a matter of public record. Searching for, obtaining, and studying these records is a public right under Texas’s Public Information Act, and can be easily obtained through a number of record search websites. DWIs in Texas cover multiple categories of infractions. A DWI can occur when a driver operates a vehicle while under the influence of either drugs or alcohol, and a test results in a blood alcohol level (BAC) of .08 or higher. Drivers with a Commercial Drivers License face more stringent laws, and can incur a DWI with a BAC of just .04. Minors can also be charged with impaired driving if any alcohol is detected at all. If charged with a DWI, a driver may face penalties that aim to prevent them from driving while intoxicated. The minimum penalties for being convicted of a DWI as a first time offender in Texas are: up to $2,000 in fines, three to 180 days in jail, a loss of driver’s license for up to a year, and an annual fee of between $1,000 and $2,000 for three years to retain driving privileges. When initially stopped, the offender has the right to refuse a blood or breath test, but will automatically have their driver’s license suspended for 180 days. The average cost of a DWI defense attorney is $7,000 to $11,000. Ethan Couch to serve two years in jail. Minimum punishments for a second offense are 30 days in jail, up to $4,000 in fines, installation of an ignition interlock device if the two offenses occurred within 5 years of each other, driving privileges revoked for up to two years, and an annual fee to retain driving licensure of up to $2,000 per year for three years. After the third offense, minimum penalties go up to between two and ten years in prison, up to $10,000 in fines, driving privilege revocation for up to two years, an annual fee to retain driving licensure of up to $2,000 per year for three years, and an upgrade from a misdemeanor to either a 2nd degree felony, 3rd degree felony, or Enhanced Felony punishment. Texas DWI law relies heavily on prior occurrences when determining punishment for an offense. For example, a third DWI offense carries with it punishments of a 3rd degree felony, up to $10,000 in fines, two to ten years in the Texas Department of Criminal Justice (TDCJ) and anywhere from between 180 days to two years of license suspension. If the offender in this case has had one prior penitentiary stay, then the punishment is upgraded to a 2nd degree felony, two to 20 years in TDCJ, and up to two years of license suspension. This is further upgraded if there are two prior penitentiary trips, which is punished with an Enhanced Felony Punishment and 25 years to life in TDCJ. Driving while intoxicated in Texas can carry additional penalties while driving with a child in the car. If an offender is pulled over and tests positive on a blood test or breathalyzer while transporting someone under the age of 15, they may face fines of up to $10,000, face jail time of up to two years, and lose their driver’s license for 180 days. The first drunk driving laws in Texas were enacted relatively recently; in 1987. 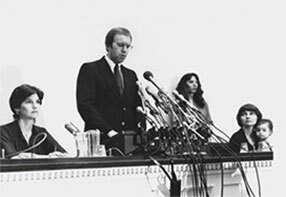 From 1981 to 1986, under pressure from such advocacy groups as the Mothers Against Drunk Driving (MADD), the United States Federal Government and then-President Ronald Reagan enacted laws to punish those caught drinking and driving. Besides raising the minimum drinking age to 21 from 18 in 1981, the two biggest changes that were enacted were that now DWI offenders would be prosecuted with the intent to convict, and that blood alcohol content (BAC) tests would determine if a driver was intoxicated, rather than the loose definition that had existed up to the point. Texas, along with a handful of other states, finally bowed to this pressure in 1987, ending what some called a “tradition” for the Lone Star state. In a New York Times Article from 1987, then-Chief Clerk for the House Committee on Liquor Regulation Eric Glenn was quoted saying “Texans sort of pride themselves on personal freedom and feel it’s their God-given right to rip up and down the highways with a beer can in hand.” Glenn said this in relation to the fact that while the age of drinking had been raised and that drunk driving laws would now be instituted in Texas, that open-container law (laws that prohibit open containers of alcohol to be present in a motor vehicle had not yet been passed. In the same article, however, Lobbyist for MADD Milo Kirk vowed to pursue enactment of open-container laws, and that “the people that live [in Texas] are disgusted with the old Texas macho image.” Until these laws passed, police in Texas could not arrest anyone drinking at the wheel unless the driver showed signs of intoxication. Texas was one of 15 states that had no laws against consuming alcohol while or briefly before operating a motor vehicle. The other states were Alabama, Alaska, Connecticut, Delaware, Florida, Georgia, Indiana, Louisiana, Maine, Mississippi, Missouri, New Mexico, Tennessee and Wyoming.